For hundreds of years, medicine was driven by anecdote and personal beliefs, without the slightest supportive evidence. In the nineteen twenties the most common operation done was ‘removal of toxic colon.’ Toxic colons were believed to be responsible for almost any symptom you could think of. Anyway, over time doctors began to recognise that if you were going to cut things out of people, or prescribe drugs, it would be nice to know if any of this activity actually did any good. And so began the dawning of the age of evidence based medicine (EBM). (Evidence based medicine is a far more recent movement than you might think, not really getting under way until the 1980s). The individuals who really drove this forward e.g. Sackett, Cochrane, Muir-Gray were extremely hard working idealists. They were highly ethical and had the patient’s interest at heart. They taught EBM on wards with students, and looked for evidence wherever they could find it. This was a much more difficult thing to do before the advent of the world wide web. I remember searching around for papers in medical libraries, taking literally hours to find the papers I was looking for. Something I can now do in seconds on the Internet. In theory, of course, EBM should be a very good thing, and in some ways it has been. However, EBM relies entirely on the belief that the evidence you are using is accurate, or true, or believable, or unbiased, or whatever form of words you are most comfortable with. This may have been true once upon a time, but things have most certainly changed. In the early days a great deal of research was carried out in major teaching Universities. Doctors and researchers would set up the trials, run them, and analyse the results. However, the turn of the millennium less than a third of drug related studies were being done in academic units. ‘The removal of research from academic centres also gives pharmaceutical companies greater control over the design of studies, analysis of data, and publication of results. The end result: among even the highest quality clinical research the odds are 5.3 times greater that commercially funded studies will support their sponsor’s products than non-commercially funded studies. The authors conclude, “Readers should carefully evaluate whether conclusions in randomized trials are supported by data.” Careful readers with enough time can sometimes spot discrepancies between data and conclusions in published studies. However, the drug companies typically retain control over the data from their sponsored trials so the majority of the researchers don’t have open access to the results from their own studies.’ Petersen M. ‘Madison Ave. has growing role in the business of drug research.’ New York Times, November, 2002. The vast majority of people have never heard of this paper. The vast majority of those who have heard of it have never read it, and the vast majority of those who have read it, have clearly not understood the implications of what they have just read. Or, if they have…they are too frightened to do anything about it. ‘Moreover, for many current scientific fields, claimed research findings may often be simply accurate measures of the prevailing bias.’ J Lonnadis. These words sound relatively mild, but the implications are explosive. Basically, many researchers are claiming that they have proved something to be true, but all they have actually done is to manipulate their research in order to confirm what they already ‘knew’ to be true. ‘According to the founder of Evidence Based Medicine experts are hindering the healthy advancement of science. Writing in this week’s British Medical Journal (BMJ), Canadian-based researcher, David Sackett, said that he would “never again lecture, write, or referee anything to do with evidence based clinical practice”. Sackett is not doing this because he has ceased to believe in evidence based clinical practice but, as the BMJ comments, because he is worried about the power of experts in stifling new ideas and wants the retirement of experts to be made compulsory. Sackett claims that the prestige of experts (including himself) gives their opinions far greater persuasive power than they deserve on scientific grounds alone.”Whether through deference, fear, or respect, others tend not to challenge them, and progress towards the truth is impaired in the presence of an expert,” he writes. Yet real science must be an arena where truth is the rule; or else the activity simply stops being science and becomes something else: Zombie science. Zombie science is a science that is dead, but is artificially kept moving by a continual infusion of funding. From a distance Zombie science look like the real thing, the surface features of a science are in place – white coats, laboratories, computer programming, PhDs, papers, conference, prizes, etc. But the Zombie is not interested in the pursuit of truth – its citations are externally-controlled and directed at non-scientific goals, and inside the Zombie everything is rotten…..
Scientists are usually too careful and clever to risk telling outright lies, but instead they push the envelope of exaggeration, selectivity and distortion as far as possible. And tolerance for this kind of untruthfulness has greatly increased over recent years. So it is now routine for scientists deliberately to ‘hype’ the significance of their status and performance and ‘spin’ the importance of their research. This entry was posted in Dr Malcolm Kendrick and tagged Bernard Lown, cholesterol, doctor, dr. malcolm mckendrick, EBM, evidence based medicine, scottish, statin nation, statins, the great cholesterol con, Toxic colons on July 1, 2013 by Dr. Malcolm Kendrick. Sackett and those like him need to remember that when sincere seekers after truth withdraw from the arena, the only ones left will be the manipulative, egotistical liars — how will that help the state of Science? It won’t. However, the truth is like a Cathedral, it takes many generations to build. We may never see it completed in our lifetime, but that doesn’t matter. We have a duty to the generations as yet unborn to build it for them. Let the liars lie, and smile. My grandmother had all her teeth removed when she was in her 50s. This was because she had arthritis. Apparently, this was a common thing to do then, but how the teeth might possibly have been the cause of her arthritis is a difficult one! I remember, even as a very young child, thinking that this was bizarre. I am constantly horrified at the trumpeting headlines on the news almost every day, stating some hideous-sounding figures regarding this cancer, or that heart condition, and how such and such a food, alone, is responsible for so many people contracting it. 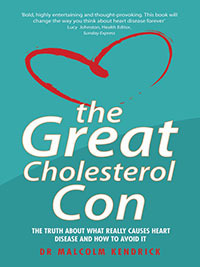 Still, we have the cholesterol lie thrust at us, despite new evidence emerging all the time showing up the myth for what it is. People are led to believe that if their blood cholesterol figure is shown to be above 5, they are likely to drop dead within weeks. 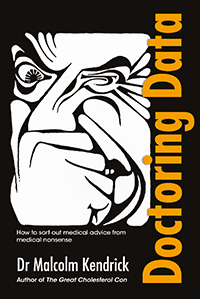 It seems to me that anything that debunks something that has been touted as truth is shouted down as loudly as possible, and what bothers me is that it often seems to be members of the medical profession (your goodself excepted, of course). My husband was prescribed Atorvastatin, even though his cholesterol levels had been shown to be below 4, following a minor heart attack 18 months ago. They were below 4 before he had the heart attack, so I think that makes the point that “high” cholesterol is not necessarily a pointer to heart disease. The statins made him feel ill, full of aches and pains, no energy, general feeling of malaise, so he stopped taking them. Within 48 hours, he was back to his normal self. We should be told the truth, not what “scientists” feel we ought to know, and scientific studies should be truly independent, and the results clearly presented. You are right. I am glad your husband is back to normal. Statins are very toxic and unpleasant drugs, I cannot believe the data on adverse events from the clinical trials. I sincerely hope that there are others like you, Dr K who are willing to speak up and hopefully expose this deception. I also hope there are others to whom you can pass the baton when you shuffle off this mortal coil (frightening thought, but it has to be faced!). The future for science looks bleak unless there are new young scientists who will think for themselves rather than idol-worshipping an older generation of men and women who would rather uphold their dubious ‘reputations’ than the truth. It is a David and Goliath situation. Thanks to you, Dr Malcolm and brave young scientists like you for taking up a sling shot on our behalf. Brave perhaps, scientist….maybe. Young…I wish. Well, you’re a lot younger than Uffe Ravnskov, Kilmer McCully and Duane Graveline. Their persistence is wonderful. We need you, and we also need younger doctors who ask questions and seek the truth, which seems well hidden. I stopped statins 2 months ago following memory problems and muscle problems. More power to your elbow! Can there be “independent science”? It seems like control by big institutions and big money is what warps the incentive structure for scientists or potential scientists who have nowhere else to go and have to conform. There can be, but clearing up the mess is a huge job. Great follower of yours and other websites like it. A thought, is Bariatric Surgery, the new Toxic Colon removal? Funny you should say that…. I have looking at bariatric surgery in some detail recently. Looks pretty dodgy to me. on bariatric surgery, turns out if you follow the post operation diet without having the operation itself. 2000 calories over 10 days though would make you feel extremely hungry, but if you’re going to die otherwise…maybe they’ll manage it. Sounds like the global warming crowd. It sounds, unfortunately, like all ‘crowds’ Once a bunch of experts get together, unanimity of opinion is demanded. If you do you agree, you are history. Money is not the only driver of this behaviour, it is hard-wired into our primitive little brains. So “toxic colon” still exists; just Google it to find all the sites willing to sell you a “colon cleanse”! So I wonder what caused surgeons to stop performing toxic colon surgery. Did someone show the “emperor had no clothes”, or did surgeons just discover a new lucrative surgery to perform? I can understand the objection to CABG based on it being too risky relative to its benefits, but can the same be said about stenting a partially blocked artery. I understand the argument that new arteries will form around the blockage, but how much discomfort is there waiting for this to happen and is it worth a stent to relieve the discomfort? I ask this question on the basis of my recent experience where I had an angioplasty following a mild heart attack. An 80-90% block of the circumflex artery was also discovered and stented. Days before the heart attack people had started to comment on my appearance, i.e. looking gray, and I had felt tired. I was less tired and “pinker” after treatment. I had also been suffering from depression prior to the heart attack but have been much less depressed since. You might be interested by one of my tussles with Prof Sackett! I wasted about a decade trying to engage the EBM establishment in substantive discussions about the limitations of epidemiological evidence – but they never would engage – instead working behind the scenes to sabotage their critics efforts. Thus it is that I put EBM into the category of Zombie science! There are some good youtube videos of his presentations and debates at Stanford and elsewhere which give an overview of the problems in research ethics that his team studies. Thanks for that. My spell checker does funny things to text sometimes.